OB-GYN Laboratory Renovation | Oculus Architects, Inc. The proposed area for this project was original to the building - with all Laboratory areas located off a perimeter corridor and behind rated walls with no natural light. 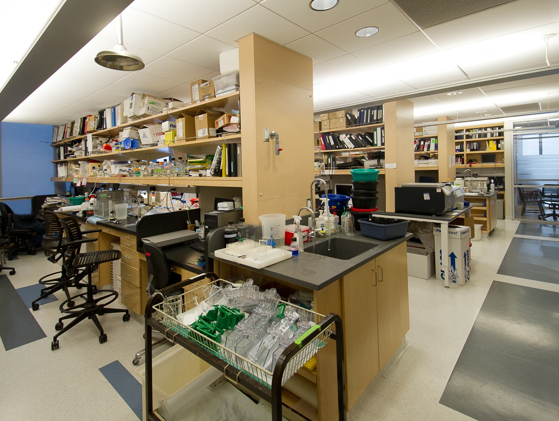 The project involved the renovation of 6,400 SF (approx 2/3) of an occupied floor to be occupied by three Principal Investigators (PI’s) and was executed with minimal disruption to neighboring Laboratories. The design for this space moved the existing corridor to the interior of the floor plate allowing the laboratory space to “move-out” to the exterior windows thereby allowing natural light into a majority of project areas. It also increased the square footage of functional laboratory by approx. 15%. Functional program requirements included Lab benches and Workstations for 34. Lab support spaces included Cell Culture, Equipment, Microscopy, and Radioactivity “Hot” rooms plus a Dark room.